Restrictions on religious beliefs and practices occur in a variety of circumstances, but this study finds that they are particularly common in countries that prohibit blasphemy, apostasy or defamation of religion. While such laws are sometimes promoted as a way to protect religion and reduce social hostilities involving religion, in practice they often serve to punish religious minorities whose beliefs are deemed unorthodox or heretical, and who therefore are seen as threatening religious harmony in the country. As of mid-2009, 59 countries (30%) had a law, rule or policy at some level of government forbidding blasphemy (remarks or writings considered to be contemptuous of God), apostasy (abandoning one’s faith) or defamation (disparagement or criticism) of particular religions or religion in general. Penalties for violating these laws, ranging from fines to imprisonment to death, were enforced in 44 of the 59 countries. This is the first time the Pew Forum has included laws against blasphemy, apostasy or defamation of religion in its ongoing study of global restrictions on religion. For consistency’s sake, the results are not incorporated into the scores for each country on the Government Restrictions Index or the Social Hostilities Index. Instead, the newly collected data are analyzed separately here. Globally, countries that have laws against blasphemy, apostasy or defamation of religion were more likely to have high government restrictions or social hostilities than countries that do not have such laws. A solid majority (59%) of countries that enforce such laws had high or very high restrictions on religion (government or social) as of mid-2009. Among countries that do not have such laws, by contrast, 58% had low restrictions or hostilities. These findings do not mean that laws against blasphemy, apostasy or defamation of religion necessarily cause higher restrictions on religion. But they do suggest that the two phenomena often go hand-in-hand: governments that impose laws against blasphemy, apostasy or defamation of religion also tend to have higher restrictions on religion. As of mid-2009, government restrictions on religion were high or very high in 23 (52%) of the 44 countries that enforce laws against blasphemy, apostasy or defamation of religion and six (40%) of the 15 countries that have such laws but do not enforce them. Among the 139 countries that do not have such laws, restrictions were high or very high in 13 (9%). Government restrictions on religion increased substantially in seven (16%) of the 44 countries where some level of government penalizes blasphemy, apostasy or defamation of religion and in two (13%) of the 15 countries where such laws exist but are not enforced. In contrast, restrictions rose substantially in five (4%) of the 139 countries with no penalties. Government restrictions on religion decreased substantially in seven (5%) of the 139 countries with no laws against blasphemy, apostasy or defamation of religion and in one (2%) of the 44 countries that enforce such laws. Governments in countries that actively enforce such laws engaged in a variety of practices that demonstrated hostility toward religious groups. This included harassment of religious groups and the use of force against religious groups, including actions that resulted in individuals being killed, physically abused, imprisoned, detained or displaced from their homes. During the two-year period from mid-2007 to mid-2009, governments in 37 (84%) of the 44 countries that actively enforce laws against blasphemy, apostasy or defamation of religion engaged in actions classified as harassment in this report.27 The share of governments engaging in harassment was even higher (93%) in the 15 countries that have but do not actively enforce such laws. In three-fourths of the 44 countries that enforce these laws (33 of the 44), government at some level used force against religious groups. Harassment and the use of force were less common in the 139 countries that do not have such laws; 60 (43%) of the countries in that category used force against religious groups and 76 (55%) harassed religious groups. Similar patterns were seen for other types of government restrictions on religion. For example, the share of national governments that showed hostility toward minority religions involving physical violence was much higher in countries where laws against blasphemy, apostasy or defamation of religion are actively enforced than in countries without such laws (55% versus 22%). A similar gap is seen among governments that characterized one or more religious groups as dangerous “cults” or “sects.” In countries that enforce such laws, nearly a quarter of the governments (23%) characterized certain religions as “cults.” In countries without such laws, 9% of governments engaged in this practice. A similar difference occurred among countries where the national government attempted to eliminate an entire religious group’s presence. 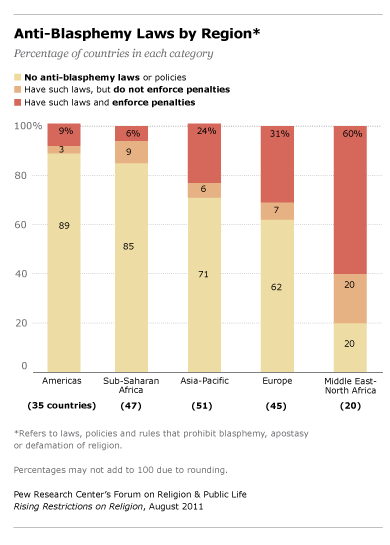 Countries that enforce laws against blasphemy, apostasy or defamation of religion were more than five times as likely to engage in such attempts as those that do not have such laws (32% vs. 6%). As of mid-2009, social hostilities involving religion were high or very high in 19 (43%) of the 44 countries that enforce laws against blasphemy, apostasy or defamation of religion and four (27%) of the 15 countries that have such laws but do not enforce them. Among the 139 countries that do not have such laws, social hostilities were high or very high in 17 (12%). This pattern generally held true for different indicators of social hostilities. For example, mob violence related to religion occurred in a greater share of countries that enforce penalties for blasphemy, apostasy or defamation of religion than in countries where there are no such laws (45% vs. 19%). The share of countries in which women were harassed for violating religious dress codes was considerably higher among those that enforce such laws (48%) than among those without such laws (6%). Social hostilities involving religion increased substantially in three (7%) of the 44 countries that enforce laws against blasphemy, apostasy or defamation of religion and in two (13%) of the 15 where such laws exist but are not actively enforced. In contrast, social hostilities increased substantially in five (4%) of the 139 countries with no such laws. Eight-in-ten countries in the Middle East-North Africa region have laws against blasphemy, apostasy or defamation of religion, the highest share of any region. These penalties are enforced in 60% of the countries in the region. In Europe, nearly four-in-ten countries (38%) have such laws and nearly a third (31%) actively enforces them. Nearly three-in-ten countries in the Asia-Pacific region have such laws and about a quarter (24%) enforces the penalties. Relatively few countries in sub-Saharan Africa (15%) or the Americas (11%) have such laws or policies. In the United States, a few state legal codes still contain anti-blasphemy laws, but they generally are not enforced.